His term of office expired years ago, but he is still widely regarded as a democratically elected leader. Nonetheless, in Abbas’s pseudo-democracy all that it took to convict Hamamreh for “spreading seeds of hate” and “publishing false information” was an image shared on Facebook that likened Abbas to a Syrian TV villain. The fact that Hamamreh did not actually do hard time is immaterial. An intimidating message was dispatched to members of the press and Internet users. They are being carefully monitored. It is an oft-sent message. A day after Hamamreh’s sentencing, Salfit-resident Anas Ismail was convicted of “libel and slander” because he clicked “Like” on a Facebook status critical of a PA official. He was sentenced to six months. Last February, Anas Awwad was sentenced in Nablus to a year’s imprisonment for posting a photo depicting Abbas as Real Madrid soccer player. 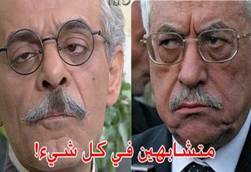 He too was magnanimously pardoned by Abbas. This is hardly new and hardly typical only of Abbas’s tenure. When his predecessor Yasser Arafat ruled the roost things were not different. Journalists were hounded for printing uncomplimentary photos of Arafat or for quoting him below the fold on the front page. This was considered insulting and insults are counted as crimes. Nor are such concepts unique to the PA. They are rampant throughout the Arab realm – even in post-Arab Spring days. Thus Egypt’s prosecutor-general has ordered the arrest of the country’s best-known satirist, Bassam Youssef, for poking fun at President Mohamed Morsi. He was, meanwhile, freed on bail and an unrelated lawsuit by an Islamic attorney had been rejected. Youssef hosts a weekly prime-time offering, El-Bernameg (“The Show”), aired each Friday on a private satellite channel. His outstanding comedic specialty is mimicking Morsi’s speech and gestures. Besides being harassed for his alleged disrespect for Morsi, Youssef is also being accused of “insulting Islam.” This is nothing to be scoffed at in a country where the Muslim Brotherhood holds sway. The aforementioned cases are all petty, vindictive and geared more than all else to warn the citizenry and deter more serious dissenters. They all point to the abysmal absence of free expression in this region, with the marked exception much-maligned Israel. Despite the outward trappings of democracy, this state of affairs belies the impression that our neighbors are fast internalizing the values of civil liberties. The freedoms to “Like,” upload, share, opine, report and publish are intrinsic components of the most elementary freedom of expression. No wonder it is enshrined in the First Amendment to the US Constitution. The arbitrary manner in which anyone can be accused of injuring a leader’s honor – and the very fact that this at all constitutes a felony – is hardly conducive to fostering the public climate that would lead the populace to welcome and sustain democracy. Defending rights is not a simple or self-evident process even in the most seasoned and stable of democracies. It becomes all the more crucial in societies where private militias and corrosive cronyism either terrorize or buy off whoever does not run with the pack. Therefore, the perceived generosity of spirit displayed by Abbas when he deigned to pardon his “insulters” in no way mitigates the travesty of trampling on basic freedoms. When all is said and done, what stood between persecuted Facebook users and prolonged terms behind bars was the caprice or cynical calculation of one chief. The fact that Abbas posed as the good guy doesn’t diminish the fact that in his latifundia it is a severely punishable crime to offend him. Abbas has not faced his electorate for a long time and elections do not anyhow on their own suffice for democracy. Without undeviating devotion to fundamental freedoms, the façade of democracy is nothing but hollow hype. Sarah, my personal experience with Arabs is that it doesn’t take too much for them to get insulted, but of course I don’t want to generalize about all of them, and some probably have thicker skin than others. Just to mention this…Abbas is a professional Holocaust denier…! I gave up hoping awhile ago that somewhere , one day, someone will stand up and say we will no longer believe their lies,deceit or propaganda! I can dream though. All honour to you Sarah. I will not comment in future but know that if you ran for office you would get my vote! Clean free elections do suffice for simple democracy. Perhaps you are thinking of liberal democracy. But the critical factor is liberalism (in the classical sense), not democracy. Hong Kong under British rule was liberal (ie free) but not democratic. When the population is brainwashed, they will probably vote the wrong way. When the system is free, voting might reduce the freedom. Competition between branches of a government, and different governments, is the key check on government power. The ancient common law of Jus Gentium has been all but forgotten, but remains as true today as in the roman republic. See Ancient Law by Maine, particularly chapter 4. ***WHAT*** are you babbling about ??? Abbas has no role to play…beyond being a rabid Jew hater, he will never ever preside over an independent terror entiy on Jewish land…despite the best efforts of Kerry and Hussein O. !